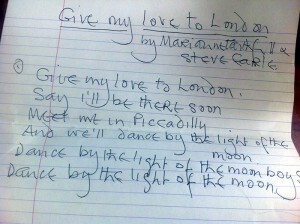 Marianne's handwritten lyrics to the title track. Give My Love To London is produced by Rob Ellis and Dimitri Tikovoi and mixed by Flood, it features an impressive roll call of studio collaborators including Adrian Utley (Portishead), Brian Eno, Ed Harcourt and Warren Ellis & Jim Sclavunos (The Bad Seeds). Songwriting contributors and co-conspirators – with Faithfull penning the majority of the lyrics – include Nick Cave, Roger Waters, Steve Earle, Tom McRae and Anna Calvi. 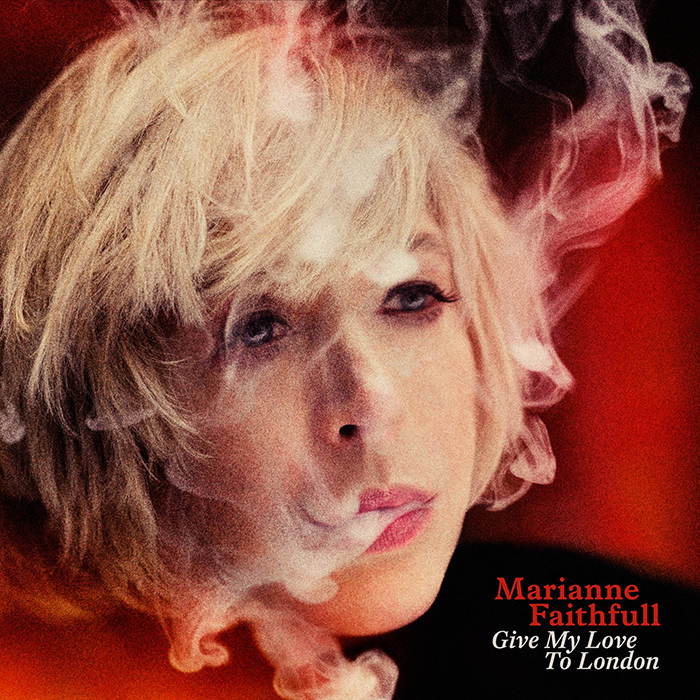 On the opposite end of the spectrum, other tracks on Give My Love To London are more introspective, with the cinematic orchestral pop of Falling Back (co-written with Anna Calvi) finding Faithfull examining the joyful powers of love. The same subject is viewed from a different angle in the delicate folk stylings of the gently melancholic Love More Or Less, written in collaboration with Tom McRae. Elsewhere, Faithfull co-wrote the moving, otherworldly Deep Water with her old friend and collaborator Nick Cave and lends her hypnotically expressive vocal delivery to his beautiful, spectral ballad Late Victorian Holocaust, written specifically for her, a lyrical song about kids on smack who are “star babies in the dark…with moonfire in our hearts” in Golborne Road, West London. “Late Victorian Holocaust is just extraordinary,” Marianne said, “It’s really one of the greatest songs ever written”. 'Falling Back' co-written with Anna Calvi, was the lead single. 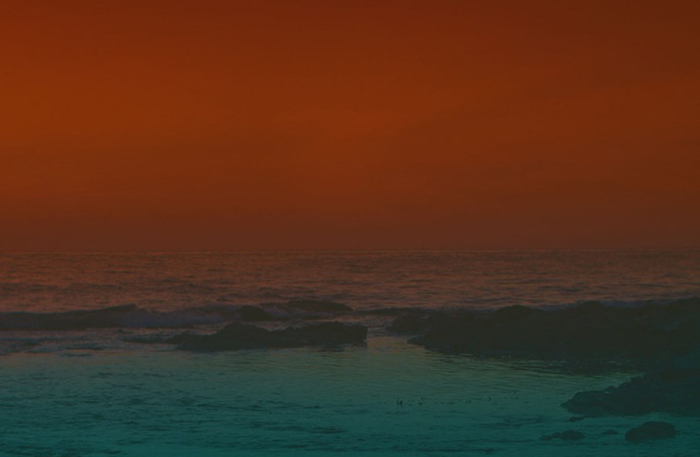 The video for the song, was a collaboration between director Martina Hoogland Ivanow and the actress Samantha Morton. 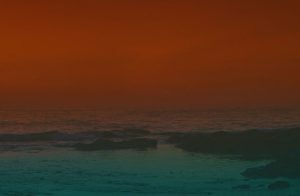 Morton had come across filmmaker and photographer Martina Hoogland Ivanow a number of years before, and has followed her progress. "Her images are like a dream. The song is very much like a dream." The pair began their collaboration with a long phone conversation and continued with thoughts over email. Ivanow was already at her summer house in Sweden where she would film. A starting point for them both was "the wilderness". "The freedom was the most rewarding part of this project," says Hoogland Ivanow. "Samantha described our collaboration as a sort of Chinese whispers – which I really like. We have quite similar ideas. She would send notes, we would talk. Our thoughts seemed connected. We were both in the countryside with children, but in different countries." 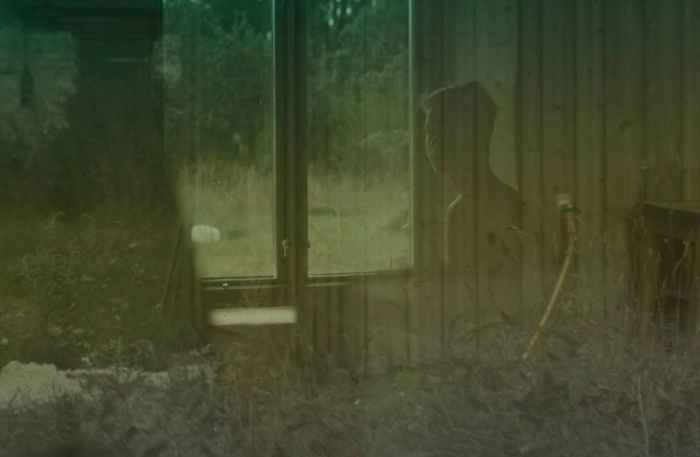 Shooting it on the island in Sweden where Ivanow lives, she says "The island Fårö felt like the perfect backdrop for the song and the film. It's a dramatic, dreamlike, an internal landscape almost like a collage of various places in the world – parts remind me of Lapland, other times Provence or northern Italy. There's limestone, white beaches and heavy rocks but even with it's obvious beauty it is a demanding landscape, it is two faced -I think that is why I like it so much."